No, I’m not talking about daydreaming although I have previously expressed my love for and interest in daydreaming as a necessary practice. But here, I’m talking about education and the internet. It is well understood that education as a discipline has made positive strides in recent decades, but still has many leaps to take. There exists an issue of a profound educational gap between demographics, an issue of comprehensive standards through which student understanding can be measured, and an issue of standards and processes by which teachers can be evaluated for feedback and professional growth, to name a few. But for this topic, let’s set these issues aside and assume internet access is available for all students and schools. 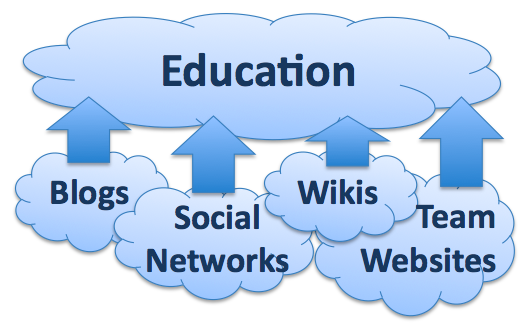 How can the internet be leveraged as an enabler of quality education? How does the existing cyber framework and status of collaborative tools enable efficient and effective education? Differing opinions and verbiage, on any topic, provide full-spectrum input, fuel discussion, and parallel what’s to be expected in the professional world. Technical skills are essential. This includes understanding technical concepts, the digital organization of information, social networking, and collaboration. Relationships are a key to happiness and provide a medium for professional growth. Digital relationships formalize relationships and provide concrete structure between multiple people, enabling this growth in an organized manner. Exploring and understanding the depths of the internet and related technologies forges new intellectual connections, and more importantly, personal interests. Blogs – As a central medium for information exchange, blogs can be used as a fantastic teaching tool. Imagine a class where after each lesson, different students memorialize class notes, in their own words, in blog posts for the rest of the class to see. Posts can be categorized, commented on, and used as a fantastic medium for discussion. Come test time, the notes are in there for all to see and use as study material. Wikis – At their core, wikis provide a semi-structured environment for the capture of knowledge. Yes, Wikipedia seems complete, but that’s not the point. Imagine a class that started with a blank wiki, and had an objective to create a new knowledge framework around class material. This would not only prove to be great study material, but would also teach students a good deal about Web 2.0, digital organization of information, and parallel the growth and interconnectedness of new knowledge through links, references, and version control. Social Networking – Private and/or public, social networks establish relationships, organize contact information, and provide a framework through which individuals can learn about other individuals and interact with them. Whether on a similar interest or topical matter, social networking for a class could be incredibly useful for building new relationships, and easier interaction with peers and professors. You can never replace a hallway conversation or a whiteboard tutorial, but this could better enable those circumstances to take place. Personal/Team Websites – Personal and/or team websites enable individuals to provide some level of scope to their interests and personal attributes while teaching hands-on technical skills. Building a website teaches organization, visualization, data management, marketing, and a whole boat load of other concepts. Whether as a class or as individuals, website creation forges new intellectual connections and practical skills that directly translate to the professional world. In the end, there’s a world of opportunity on the web, and as education tackles its outstanding issues as a whole, it’s only beneficial to use and leverage the internet as a medium to foster new learning and create new opportunity for students across the US and the world.